I met up with an old colleague who had moved on from banking and finance a decade ago, and he is now the proud proprietor behind a collection of shops and restaurants. On my way to taking a walk down memory lane, he was kind enough to treat me to a simple lunch in the very area I was headed to. Café Lisette (カフェリゼッタ) is a small, French-style café in the tranquil alleys next to the Futako-Tamagawa (二子玉川) train station. The atmosphere makes one feel as if one were indeed in a small town in France, and on this day I found myself seated next to a table of Froggies. The menu is simple, the decor rustic, the pricing reasonable. I took the tarte salée du jour, which had jambon, asparagus and tomato inside. Served with some simple greens, lentils and shredded carrots. Delicious. In the future, I need to look at the menu a little more carefully... I ordered the cidre chaud without realizing that it came with full cream and cinnamon... which completely changed the experience, not to mention the calorie count! I had originally planned to take a dessert, but I guess my host didn't think I needed the extra calories... Oh well. I love this place. It's so quaint and peaceful - a little hideaway. The place wasn't buzzing, but there were a few tables of customers - including a well-known Japanese food critic and stylist. A place like this would never survive in Hong Kong, but it does very well in cities like Tokyo and perhaps Taipei. It's French yet very Japanese in atmosphere. I'd love to come back the next time I'm in the neighborhood. On the back of a shopping trip to Shinjuku, the Wommer and I passed by Omoide Yokocho (思い出横丁), a couple of alleys next to the train tracks that were packed with yakitori (焼き鳥) joints where fumes were just billowing out. He was determined to grab a couple of sticks, even though we were soon to have dinner. We went through the door at No.2 Horaiya (第二宝来家), attracted by the signage claiming to use Bincho charcoal (備長炭). The Wommer ordered us a few different sticks, then wondered why it was that some of the usual yakitori items weren't available. Took him a while to realize that this place was offering pork offal (もつ焼)... So everything that we ordered - tongue, heart, and lard (yes, solid chunks of pork fat) - came from a pig. Oh well, next time we'll hit a real yakitori-ya. 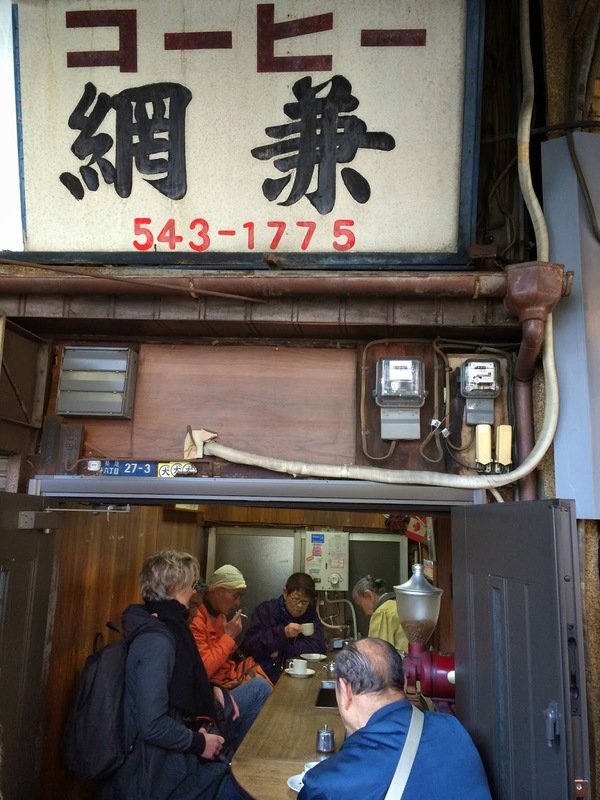 On my final morning in Tokyo, I made a long-overdue return to Tsukiji Market (築地市場) with the Wommer. Believe it or not, my reason for going to the most famous fish market in the world had nothing to do with fish. I'd done my fair share of sushi breakfasts, and I have no intention of standing in line for hours. I was after something else entirely. Yoshinoya (吉野家) is a worldwide chain of fast food joints serving gyu-don (牛丼). What many people don't know is that the chain got started in 1899 (明治三二年) at the fish market (魚河岸) in Nihonbashi (日本橋), selling beef to fishmongers. 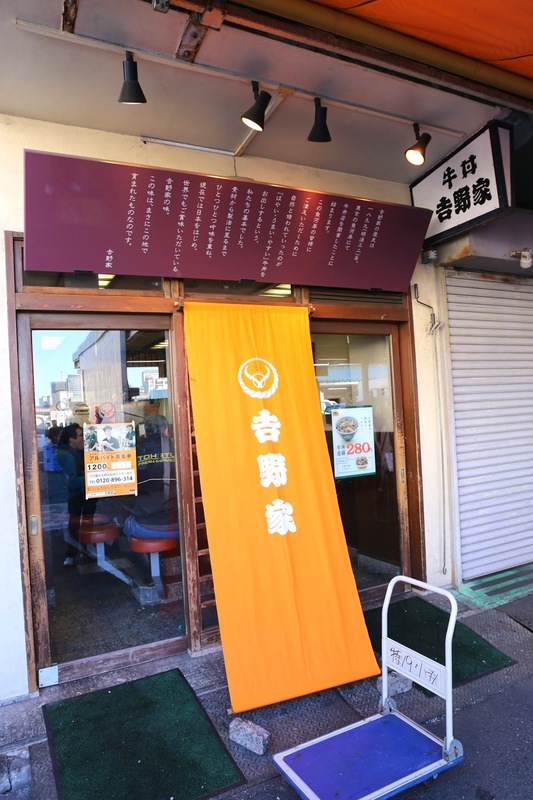 When the fish market moved to Tsukiji years later, Yoshinoya moved with the market to the present location. I have loved eating gyu-don at Yoshinoya ever since my days of growing up in Tokyo some 30 years ago, so I just had to make the pilgrimage to the very first shop (一号店). We sat down and ordered the beef bowl with egg and spring onions (牛ねぎ玉丼). In addition to the familiar sight of sliced beef and onions over rice, there was a plate of chopped spring onions, a bowl with a raw egg, and we were even given a separator to extract the yolk. I put the bulk of the spring onions on top of the beef, then dumped the whole egg on top. Mixing everything up with my chopsticks got the yolk over not just the beef but also the rice underneath. The result? A little bowl from heaven for brekkie. At JPY 380, this was much more satisfying to me than anything Daiwa Sushi (大和鮨) or Sushi Dai (鮨大) could offer me. We strolled around the market to see what kind of goodies we can pick up, and suddenly smelled some coffee from nearby. 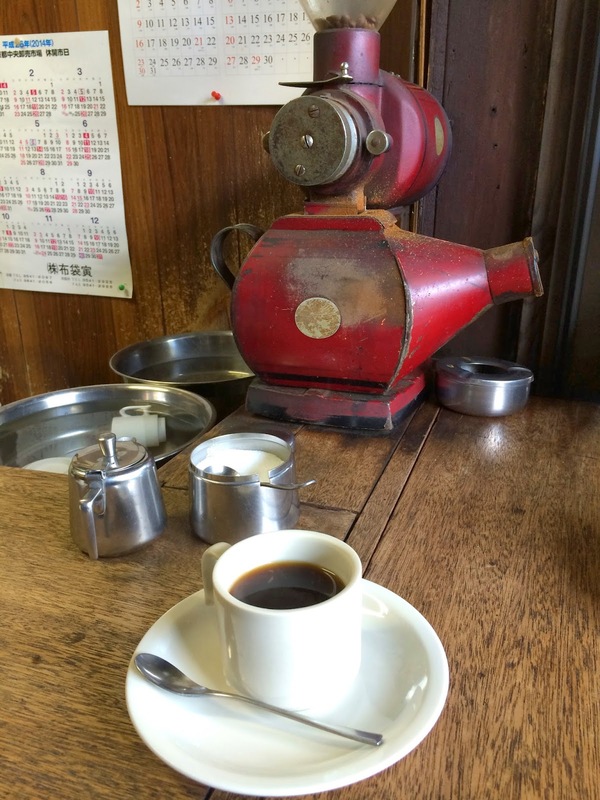 We were surprised to stumble upon Coffee Amikane (コーヒー網兼), a small shop with an open store front. The tiny space only had 6 seats around the counter, and we decided to sit and grab ourselves a cup of joe. The octogenarian grandma behind the counter only opens the shop up for business 3 days a week, and for only 3 hours in the morning each day. She's been here for more than 50 years, and her love of boats and sailing is clear. A board on the wall displays various types of nautical knots with actual ropes. Everything here is old school. She grinds her own beans with this old grinder, then pours the grounds into a cloth-lined funnel placed over an enamel pot. Water is boiled in another enamel pot on the gas stove, poured onto the grounds, and drips through the funnel to the serving pot. Both the coffee cups and the plates are heated in a water bath placed directly on the stove, so that the hot coffee wouldn't get cold too quickly. Grandma clearly cares about her patrons. This trip was just too damn short. I need to come back to Japan a little more so that I can increase my chances of finding more of these little hidden treasures!